"Electrolyzed water" protects us from the bacillus. An efficient measure to protect ourselves from bacillus is the use of 'Electrolyzed water" The washing potential of "Alkaline electrolyzed water" and the sterilizing potential of "Acidic electrolyzed water" enable us to achieve and maintain "Cleanliness". Only "Water", "Salt", and "Electricity" is needed to generate electrolyzed water. No special raw materials are required to generate electrolyzed water other than "Water", "Salt" and "Electricity". Filters and water softeners are used to eliminate chlorinated hydrocarbons, smell, and impurities from tap water, and then salt is added.Electrolyzing this salt brine generates "Strong alkaline electrolyzed water" and "Strong acidic electrolyzed water". Strong alkaline electrolyzed water (12.0 pH) with strong washing power will be generated from the positive electrode and strong acidic electrolyzed water (3.0 pH) with high bacterium sterilizing power will be generated from the negative electrode. Washing and sterilizing; Double powered electrolyzed water will efficiently eliminate hidden bacterium. When bacterium hides within dirt particles, ordinary sterilizers are not sufficient in removing the bacterium. Our "Electrolyzed water" can solve this problem with its double power: washing and sterilizing. First, Alkaline electrolyzed water removes the dirt with its washing power by breaking down the protein and oils where bacterium hides. 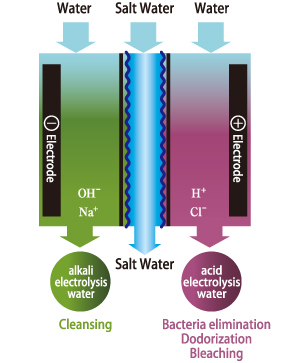 Then the Acidic electrolyzed water sterilizes the bacterium. Acid hypo chlorite contained in electrolyzed oxidizing water effectively sterilizes bacterium during washing . Strong acidic electrolyzed water eliminates colon bacillus, salmonellastaphylococcus and other bacillus that cause food poisoning.